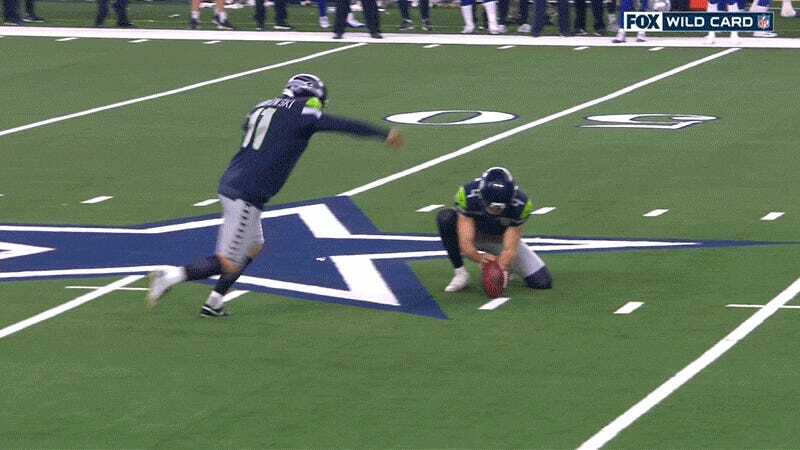 Seahawks kicker Seabastian Janikowski injured his leg on a missed 57-yard field goal attempt at the end of the first half of tonight’s defensive struggle against the Cowboys, and Seattle has apparently decided that they don’t trust star punter Michael Dickson to attempt even extra points. The Seahawks converted the two-point, going up 14-10. On the following kickoff, Dickson dropkicked. The additional point is already coming in handy, as Dallas responded with a touchdown that only gave them a three-point lead.